Maud had been let down by her non-regulation boots on her first attempt to get to the front. On this second occasion, Maud was better prepared. “This time I made no mistake. I got military boots and made an identification disc, which I stamped ‘No. 4850. Pte. 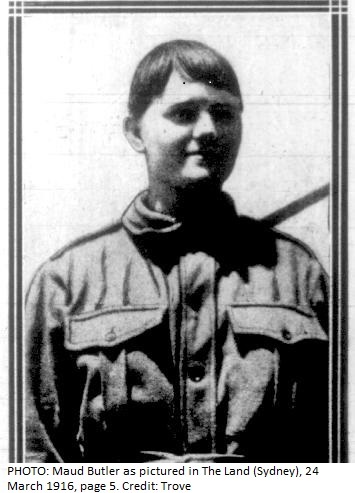 Harry Denton, 15th Battalion, 3rd Infantry Brigade, Australia.” (She had also managed, somehow, to get hold of a revolver.) “Then I waited my chance,” Maud told the reporters. Maud was able to board the ship by pretending she was “befuddled with drink…” Singleton Argus, March 11, 1916. The evening of Tuesday, March 7, 1916, found Maud waiting patiently in the darkness on the docks. She had no intention of climbing up a 25ft rope this time. Instead, she was watching what one reporter described as “the zig-zag line known as the ‘Drunks Procession’,” winding its way onto a troopship. 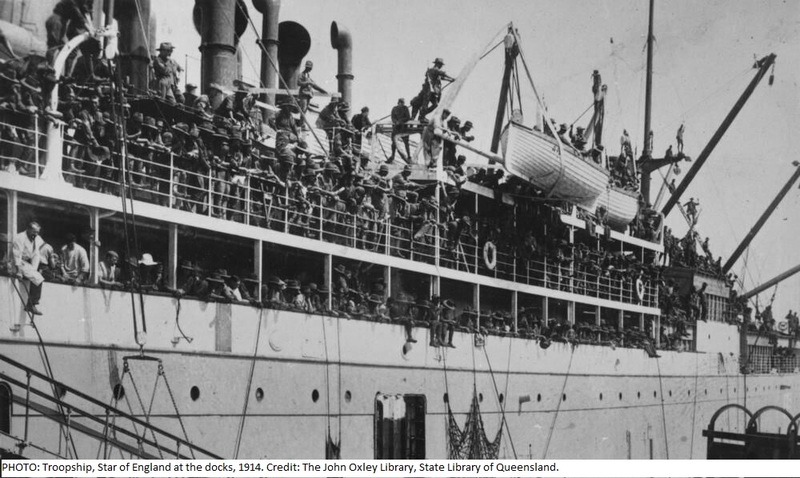 It was the night before the ship’s departure for Egypt, and “an unsteady, straggling line of men – soldiers back from final leave” were boarding. “Walking with heavy lurches to either side, and making rough verbal imitations of the noises uttered by the men, Miss Butler essayed a few passable hiccups and eluded the wearied sentries.” Singleton Argus, March 11, 1916. Maud had once again managed to successfully board a troopship, this time the Star of England, carrying the 15th Reinforcements for the 13th Battalion of the Australian Imperial Force (4th Infantry Brigade). 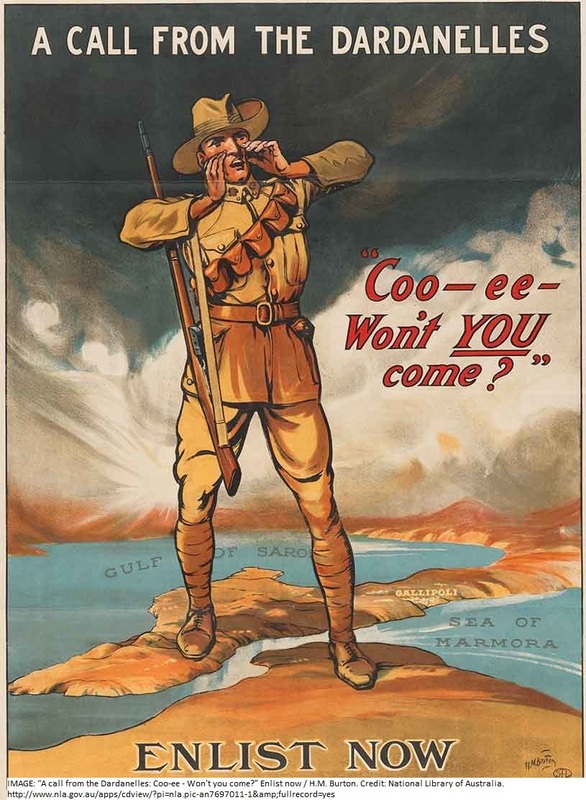 Among those on board were men who had been inspired to join up by one of the first recruitment efforts held in NSW in 1915, known as the ‘Coo-ee March’. 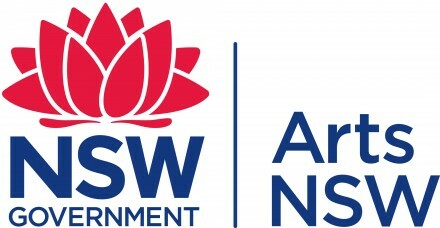 William T Hitchen, a Gilgandra plumber, came up with the idea of a march from Gilgandra to Sydney to inspire and attract greater numbers of troops. Starting with 35 men in Gilgandra, the Coo-ee marchers held recruitment demonstrations in each town along the way, with the 320 mile venture resulting in 263 recruits by the time they reached the Liverpool camp on 12 November, 1915. At Liverpool, the men undertook a four month training program before boarding the Star of England and commencing their journey to Egypt – and ultimately to France – on March 8, 1916. But the patriotic Maud would not go with them. Once aboard the troopship, Maud hid at the back of the ship. She was asleep there in the morning when a ship’s officer found her. He asked for her identification disc. Unfortunately for Maud, her preparations again failed her. With a sinking heart Maud watched the officer open his book and look for the corresponding number there. “That’s not the name here against that number,” the officer had said. Maud’s gun and uniform were taken from her and she was sentenced to be gaoled “until the rising of the court”, meaning until the court closed for the day. “I am tired of asking. There was nothing for it but to stow away and try to bluff it through” Singleton Argus, March 11, 1916. Afterwards Maud was interviewed again by reporters. Although she was less eager to talk than she had been the first time, Maud declared that she did want the public to understand why she had tried to get on board a second time. “J.S.” was mistaken, of course, because Maud in fact had only tried twice at that stage – at least as far as we know. But Australians hadn’t heard the last of Maud Butler.